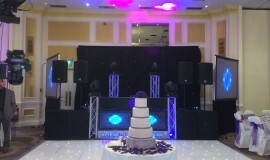 AK Musik is committed to offering the best wedding DJ services for traditional Asian and Indian celebrations in the UK. We specialise in Bollywood and Bhangra style music, delivering a soundtrack that will get your guests on their feet and having fun. With thousands of tracks to choose from we will ensure the whole night is filled with great music. We can even blend styles for you if requested. We have been offering DJ services for weddings for over a decade, taking a great deal of pride from our ability to turn your event into a memorable celebration. The music we choose blends perfectly with our lighting equipment and the theme of your event. We also have an extensive range of additional options to choose from if you want extra flair. Our lighting systems are top of the range and can be synced with the playlist. An LED dance floor is available as well as smoke and bubble machines, projectors and laser systems. When you choose AK Musik as your Bollywood Wedding DJ you can expect the most professional service with a unique personal feel. We are committed to making your event successful and supporting you throughout the whole thing. If you come to us early we can discuss the options with you, help with selecting a theme and ensure the decorations, music and additional extras all fit together seamlessly. Over the last fourteen years we have catered for parties of every size. We offer a range of different packages to suit the venue and your guest list. Our equipment is amazingly flexible so we can easily adapt and customise it for you. We have catered for parties less than 250 people, larger events up to 600 and the biggest celebrations with over 1500 guests. Our professional sound system guarantees great quality regardless of the amount of people attending and the size of the venue. One of the most attractive aspects of a Bollywood style wedding is the amazing atmosphere. With AK Musik your event will be fun, energetic, classy and memorable. Your DJ will entertain guests and play music to get them dancing. We can even arrange for traditional dancers to appear, make the event more interactive and teach guests a dance or two. AK Musik is committed to customer satisfaction and offering a first rate service every time. We are proud of the reputation we have built as one of the most talented, passionate and entertaining wedding DJs in the UK. For further details about what we have to offer please call 07985105182 and speak to us. We always enjoy hearing about your event and going over the options we have available.